Nothing teaches life lessons like the game of golf, and you won't find a more family-friendly golf course in Wisconsin than Quit Qui Oc. 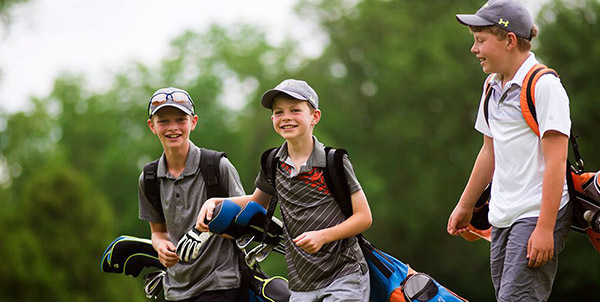 We encourage juniors and families to come out and spend quality time on the golf course. Juniors are welcome to play on their own as long as they can keep up with play and use good golf course etiquette. Junior Golfers when accompanied by a paying adult. Available all season long. Cart rental is additional. Quit Qui Oc Golf Club is unique in that our first 5 holes loop around and come back to the clubhouse. It's the perfect opportunity to play a few holes with your family and work on your golf game. Play The Loop any time after 5:30 pm* and enjoy discounted greens fees! *After 6 pm on Tuesday nights. Program is designed for students ages 7-13 and beginners. Lessons will focus on golf swing fundamentals of posture, grip and alignment, as well as, putting, chipping, golf course etiquette and basic rules. Additionally, students will have the opportunity to play on the golf course. Classes are limited to the first 45 students to enroll in each Class. Lessons include...instruction for 5 weeks, QQO cap, Titleist golf balls, and on course play. $50 per student, $80 for two students from the same family, and $95 for three students from the same family. Contact: Call the pro-shop at 920-876-2833 or email Rachel Montaba at tmontaba@msn.com for availability. This program is designed for juniors who have previous experience and would like to play casually with friends or prepare for playing on a high school golf team. Each week juniors will start with a 20-30 minute lesson followed by 9 holes of play. League will be limited to 24 players. Cost: $50 per student, $80 for two, and $95 for three from the same family. Price includes weekly lesson, on-course play, QQO Cap and sleeve of Titleist golf balls. Team Prep League starts Tuesday, June 11th, 2019. Registration deadline, Tuesday, June 11th. Quit-Qui-Oc Golf Club has participated in the PGA Junior Golf League for two years. The program has been a wonderful success, giving juniors ages 10-13 a chance to play in a competitive, yet fun setting. Competing with other Sheboygan County courses, QQO finished 1st in 2013, 2nd in 2014, and 3rd in 2015. The team consists of 8-12 boys and girls ages 10-13. Teams include one adult and one junior golfer. Adult can be any relation to the junior; parent, grandparent, extended family or even a friend. This is a fun league designed so family members get to spend time with one another. 18 Hole Course or The Glacial Nine, or to book a golf lesson. same day tee time on the Glacial Nine.